I’ll never forget driving on the Wabash campus on the night of April 15. It was maybe 30 minutes after violent thunderstorms and high winds had swept through Crawfordsville leaving a path of damage impossible to imagine. Aside from the damage to my own house, the first thing I saw was the roof of Wabash’s old Kingery Hall, mostly ripped off and laying in the middle of the railroad tracks off Grant Avenue. The trees — pines and maples, mostly — that surrounded old Kingery and that made it such a pristine spot on campus were broken in half with limbs scattered all over the ground. I then walked north through the Fuller Arboretum when I came upon one of my favorite trees in the stand, a giant and very old white oak. The oak, which had withstood over 100 years of similar storms, blizzards, and ice, had fallen. On its way down, it either damaged or took out a couple maple trees and maybe a hemlock. The scene changed little as I walked through the woods and out onto the College’s grassy mall. I stood and looked north up the drive of the main entrance and could barely make out Trippet Hall in the background. The drive was covered with downed trees, spruce and maple. 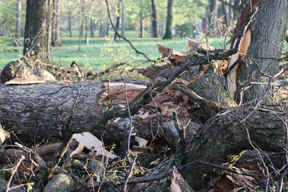 The losses there were complete; other trees — 14 or 15 spread across the Arboretum — had been badly damaged. We were just weeks away from the end of classes and less than a month away from graduation, which would be followed a couple weeks later by reunion weekend. So Wabash’s Sodexho Campus Services team had little time to do anything but clean up the mess. And what a mess it was. By Commencement Weekend, unless you looked closely for signs of the damage (or saw the huge blue tarp covering Kingery Hall), you probably hardly noticed that a storm had come through. A week after reunion weekend, crews began the work all over again. The 15 trees badly damaged in the April storm were taken down in early June. In many respects, the trees appeared healthy to the naked eye. But grounds supervisor Tim Riley knew that because of deep cracks and breaks in the bark, the trees would soon become diseased and die. So down came the trees in a flurry of activity over a couple of weeks in the heat of June. I quickly began to wonder what was happening to all of the trees that seemed to disappear from the Arboretum minutes after they had been sawed to the ground. Last week, Tim Riley came by my office to complete the story; what a remarkable story it is. The good wood from the trees was harvested and donated to the Montgomery County Woodworkers and Carvers. Prior to Tim’s visit to my office, I never knew the group existed! I’ve since discovered the Woodworkers and Carvers club is 60 members strong. I found out that many of the trees became useful logs that were sold for lumber with all proceeds from the sale going to promote 4-H Woodworking in Montgomery, Putnam, and Parke counties. Other trees and logs have been fashioned into a full range of useful items and furniture. Last week Tim brought me several beautiful ballpoint pens that had been handcrafted from the wood of a giant maple tree. He also shared with me a thoughtful thank you note from the Woodworkers and Carvers, signed by more than two-dozen of the group’s members. The note said quite simply, "Thank you, Wabash." I share this story for two reasons, the first of which is to draw attention to the good work of the Montgomery County Woodworkers and Carvers. On a more deeply personal note, the story provides a wonderful lesson on the cycles of life. 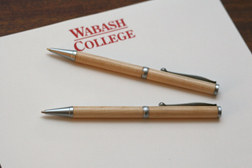 What appeared to be a ruinous loss for Wabash College became a wonderful gift for many others. The hefty trees that shadowed Wabash’s most historic buildings live on in useful lumber that will build homes and furnishings, as well as keepsake mementos that may be passed on for generations.